Since winter is here, I thought about talking to you about a book that Neil and Catharine co-wrote together. This book invites you to curl up beside the fire and journey to a time when Montrealers skied down Peel Street and the Laurentians were ”the wild west” of Quebec. 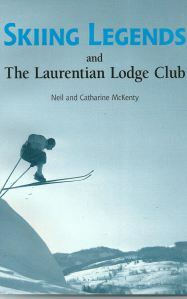 For two expatriate Torontonians, Neil and Catharine McKenty, this journey begins at the Laurentian Lodge Club in Shawbridge, now Prévost. There we meet skiing legend like ”Jackrabbit” Johannsen, Harry Pangman and Barbara Kemp. With them we discover the perils of ”Foster’s Folly”, the world’s first ski tow, we climb Mont Tremblant in the Thirties and we ride the ski trains with their smells of wax, orange peels and cigar smoke. And we also meet those earlier legends, the larger-than-life Curé Labelle, and the tragic Viscount D’Ivry who lived in a magnificent chateau on the shores of Lac-Manitou. This is also the story of how the Laurentians helped Montrealers weather two World Wars and the Depression. It’s a great story and the authors have told it well. Previous Entry: NEIL’S RADIO SHOW. Next Entry: BLAST FROM THE PAST!